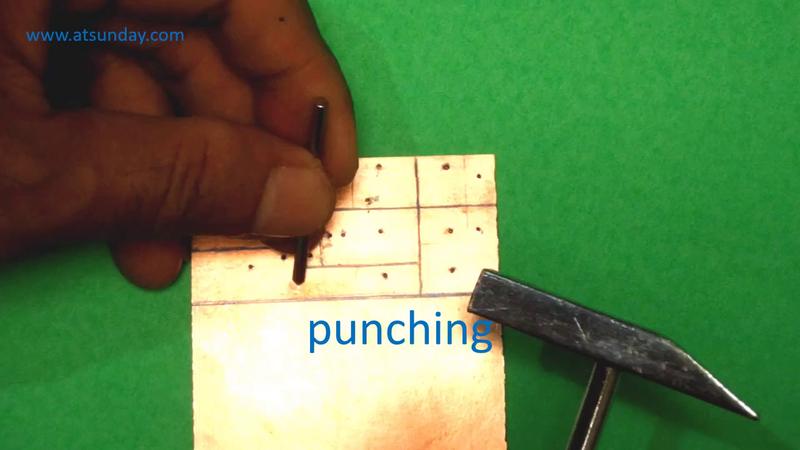 This procedure for making copper trace of Printed Circuit Board uses only cutter and soldering iron.. Cheap, easy and fast, this procedure is suitable for simple electronic circuit. The sample PCB prototype in this article will be used for brake lights flashing circuit with adjustable frequency. Draw the copper conductor paths on the PCB. In this procedure, the conductor that covered in ink will be removed. The finished PCB copper traces are wide and can transmit big current, it cools the circuit, and conductor is not easily damaged if soldered too often or too hot. Therefore this PCB is suitable for simple circuits with high power and current. Whereas in the chemical dyeing procedure (etching), the copper part covered in ink will be used as a conductor. And the part that is not covered with ink will disappear because it dissolves in a chemical solution. 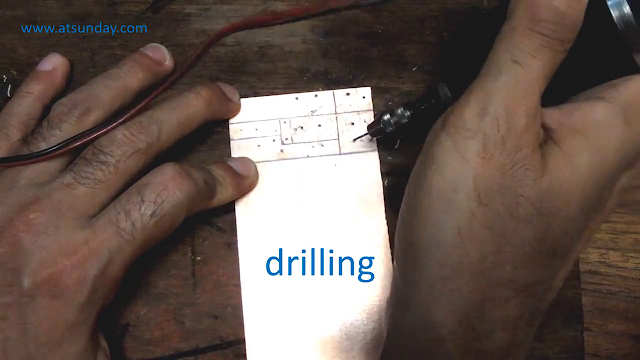 The first video above shows the process: drawing, punching, drilling, and scratching or cutting the conductor. 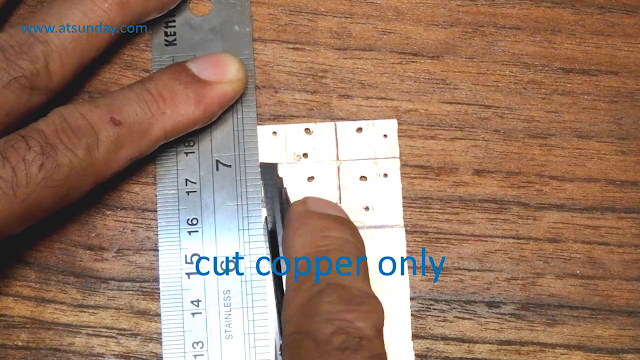 Note that only copper conductors are cut. The non conductor layer (substrate) of PCB is not cut. The second video shows the process: widen the gap between conductors, test adjacent conductors, cut the PCB. Mark points that will be drilled with punch, you can also use nail. Those punch marks will ensure drill bit does not slip, when it first hits the PCB. Drill all component holes with diameter drill as needed, usually 1 mm diameter drill bit. 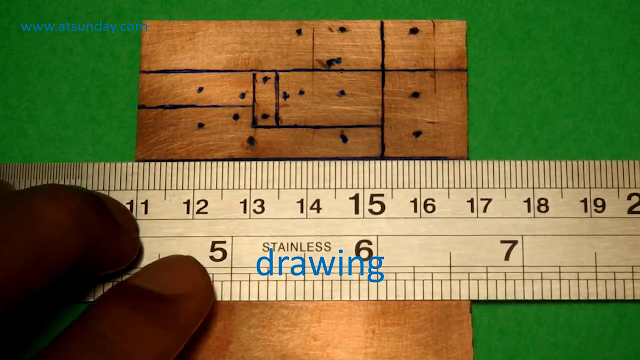 Cut copper according to the line drawn. Note that only the copper conductor is cut. While the non conductor layer (substrate) is not cut. For this reason, the cutter knife should not be pressed too hard, and must be scratched several times. It will feel lighter when scratching if the copper has been cut. The shape of conductor will be quadrilateral-like, because this shape is easily made with a knife scratch. Then the gap is formed between copper, it is widened by heating with soldering iron. Make sure the solder tip is pointed and clean of lead and dirt, to make it easier and the results are neat. 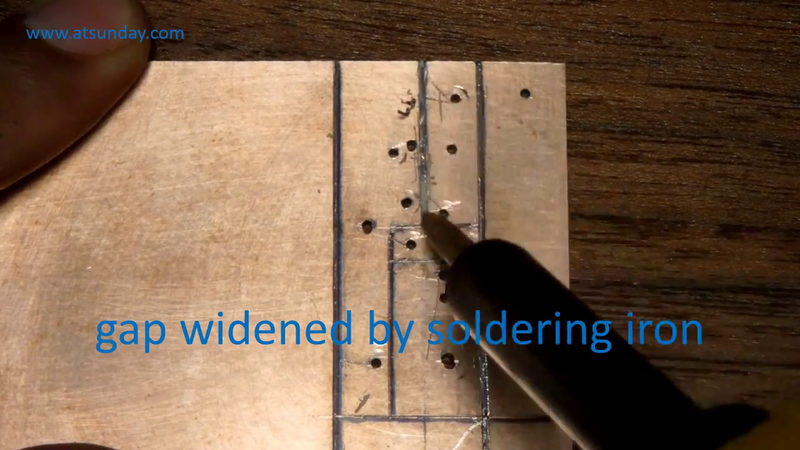 The video shows that copper debris is released when heated and pushed by soldering iron, and the gap widens. 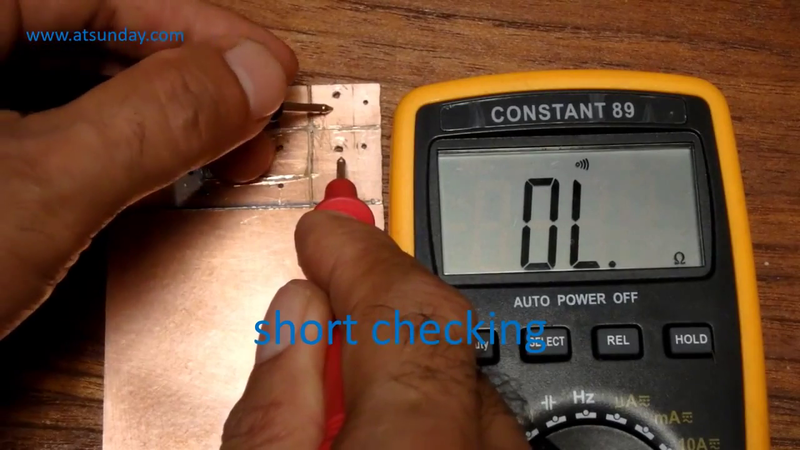 Check conductivity with ohm meter. If between two adjacent conductors is still connected (short circuit), then scratch the knife again, and expand the gap again with soldering iron. If there is nothing conductor short circuit. Then the PCB can be cut. Cutting is the last thing to do, to make it easier to hold the PCB during the process. If the PCB is too small, it is difficult to hold it. If cutting using a cutter it must be scratched several times. 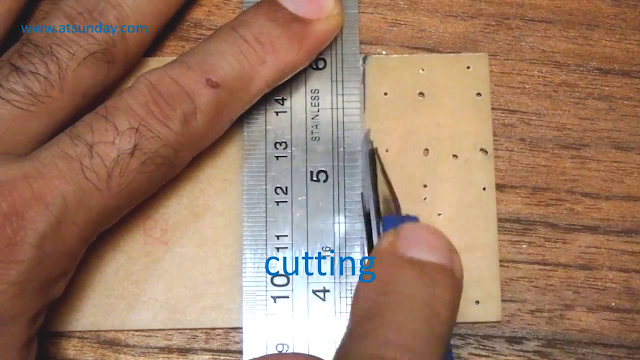 The cutter knife must also scratch the back of the PCB also, or the non conductor layer (substrate). Cutting can also be done with a hacksaw or a plywood saw.